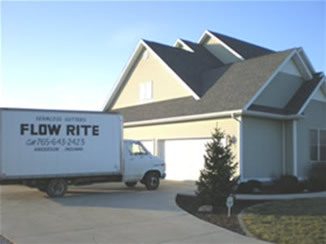 COMPANY INFORMATION Hello, I, Mike and my wife Sandy own Flow-Rite Guttering. I have been around gutter, siding, and overhang work for over thirty six years. I purchased Flow-Rite from my dad in 2000 and he started Flow-Rite in 1972. His motto was to give a fair price, quality work, and good service and we are continuing his motto after thirty six years. We are still from the old school, we believe a hand shake is a man’s or woman’s word. We have learned over the year’s what to look for when we come out to your home or business for your free estimate to give you a quality job. We form our own corner in our gutter so you only have one seam. We use pop rivets not screws, because screws over the years will rust and they are great leaf catcher's. We manufacture our own gutter guard, Stay Clean Leaf Guard, the absolute best leaf guard product on the market for the the price. Stay Clean Leaf Guard will fit in most existing gutters. We install both five inch and six inch gutter, 2" by 3" or 3" by 4" downspouts. We have 21 different colors to choose from.